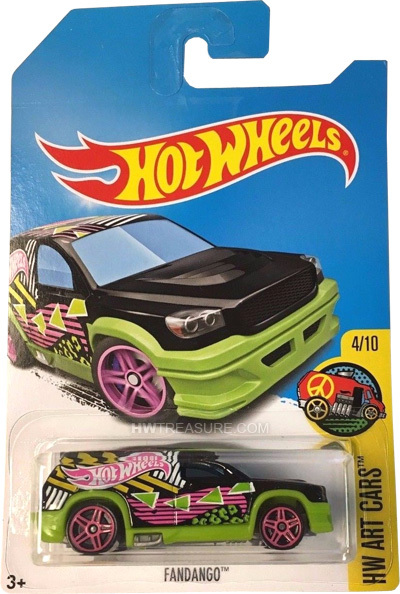 DVD03 is a 2017 Treasure Hunt and 4/10 in the HW Art Cars series. The black vehicle is decorated with bright yellow, green, pink, and white stripes, shapes, and leopard print. 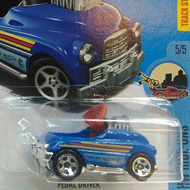 The low production symbol is on the roof and the Hot Wheels logo is on the sides. The car has blue tinted windows, a green interior, PR5 wheels with pink rims, and a Malaysia base. 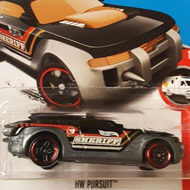 This vehicle can be found in mix “H” of 2017 Hot Wheels mainline cases. Fandango made its debut in the 2001 First Editions series. It is an original design of a mini van.